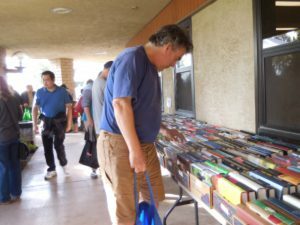 FOTAGL supports the Library with bi-monthly book sales, held the 2nd Saturday of every other month, from 10:00-3:00, at the Library. Friends Members enjoy early admission and shopping at 9:30 a.m. The $2.00 a Bag Sale begins at 1:00 p.m. (As many books as you can fit into a grocery bag!). Remember we are now able to process credit card and debit card purchases (with a minimum $10 cash-out). We gratefully accept donations of gently used books (please no worn, yellow, dirty or moldy items), CD’s and DVD’s (please no tapes or cassettes). Please bring them to the library help desk or the work room if a volunteer is present. Our February book sale was a great success (having the Antique Show was a great help). Thanks so much for your support! The next sale is Saturday, April 13th from 9:30 to 3 p.m. for members, 10 to 3 p.m. for non-members. As usual, we will have an awesome selection of books, media and special price items. Since FOTAGL’s mission is to provide monetary support for the Arroyo Grande Library, our volunteers are always looking for creative opportunities to raise money. 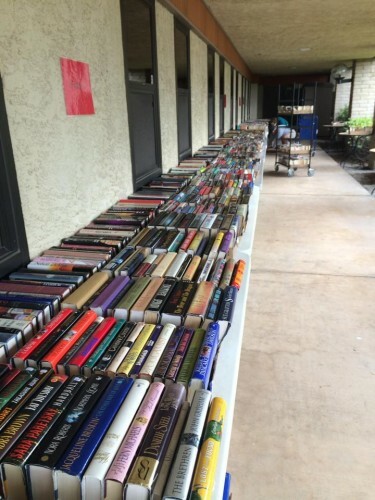 Our newest venture is selling used books on Amazon. A small, but mighty and dedicated team culls through donations, scans books to determine salability, prices and lists the books on Amazon, monitors the website for price changes, and then ships the books to the customers who have purchased them. Friends’ member Lorraine Brewster started and ran the program single-handedly for almost two-years, achieving amazing success; however, it became obvious that if our sales were to continue to grow, it would require the efforts of a team of people. In March 2016, we officially launched the FOTAGL site on Amazon with a five person team. As our sales have now grown from a few hundred dollars a month to the $1404.73 profit we netted in December 2018 (on sales of 43 books) so has our team. In 2018 we had net profits of $12,987.18 (from the sale of 614 books)–all proceeds going to the AG Library. Today, it includes ten members: Sue Barton, Janet Baxter, Lorraine Brewster, Roger Connolly, Peggy Heinrichs (chair), Barbara Levenson, Ellen Polinsky, Juliana Sessions, Danna Weidner and Jean Whipple. Currently we have @ 800 books listed for sale. To see what they are, and perhaps find something special to buy, visit our ‘storefront’ at Friends of the Arroyo Grande Library @Amazon.com. If you’d like to learn more about this project and/or are interested in joining the Internet Sales Team, send us an email at fotaglinternetbooksales@gmail.com. As a final note, this project has in no way diminished the quality or quantity of books that are available at our bi-monthly book sales.